As much as we have good intentions to get on a schedule and stay on track, so many distractions can be thrown in our way. An important thing to do when trying to live a disciplined life is to take some time to evaluate your daily life. Determine what the essentials are, and write down what the non-essentials are as well. Then, prayerfully consider what you can eliminate from your life in order to have more time to focus on the things that are truly essential. What is essential and what is non-essential? Well, it will differ for everyone. Your relationship with God is the most essential, which will include Bible reading, praying, and Scripture memorization and application. Relationships with family and friends will be essential, but the way you live out those relationships may have some non-essential components. Depending on your season in life, school work, a husband, or children may be essentials in your life. Depending on your responsibilities, a job and/or care and upkeep of a house or room may be an essential. Non-essentials are sometimes harder to define. I am certainly not advocating that we rid ourselves of all the fun things in our life! Time to relax is essential for good health, and fun things give you the needed break and clearing of the mind in order to go on and do the bigger essentials well. However, as a whole our culture is inundated with things that really aren't essential. One non-essential that I have chosen to eliminate from my life is that of online chatting or instant messaging. To guard from losing time with superficial chatting while online when I really need to do research or write emails, papers, or blog posts, I simply keep myself logged out of Google Talk and Facebook chat. That way, I don't feel bad in telling people that I really shouldn't talk when they pop up. I'm not saying that everyone should get rid of online chatting. I have had some good conversations through it, but on a whole I've observed that they seem to be very superficial and chatty. In addition, usually when I'm chatting I'm also trying to accomplish something else on the computer, so the quality of both the conversation and the thing I'm reading or writing goes down. I much prefer getting to know someone face-to-face or through email, letters, or phone calls, all of which seem to be a little more in-depth. In order to have more time to interact in these ways, I very rarely sign in to online chatting programs. I also don't watch much TV, which I "affectionately" refer to as the Time Vacuum. So much that's on it is simply not worth watching. We never had cable as a child, which I am very happy about, although we did have Sky Angel and then Dish Network later on. Our parents set time limits on what we could watch - usually no more than a 1/2 hour program a day, sometimes not even that - and I am so grateful that they did. Yes, some shows are fun (we enjoyed mostly older shows, such as Roy Rogers, Annie Oakley, The Lone Ranger, Beverley Hillbillies, The Andy Griffith Show, etc.) but often they're not worth spending much time on. At college, I certainly don't have time to watch them, and I very rarely even watch a movie. Sometimes it's fun to watch something to relax with family or friends or have something on while you do activities like embroidery, but overall, I'd rather live life than watch other people live it. Non-essentials may be certain websites, blogs, or social networking sites, or magazines, books, movies, TV shows, or other hobbies. In small amounts, these things may be good. However, it's easy to get overwhelmed with too much information or too many things you're trying to do at once, and the quality of everything suffers. If you don't have time to do an in-depth look at all your activities right now, prupose to eliminate just one non-essential. You may be surprised at how much of a difference it can make! By writing this post, I am inspired once again to go through all of the blogs I've subscribed to through Google homepage and unsubscribe to the less helpful ones. There is so much to read out there, but I must be wise in having time to read good quality instead of simply a lot of quantity. Do you have a lot of non-essential items in your life? What are examples of things you prioritize as essential and things you prioritize as non-essential? 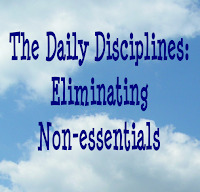 What is one non-essential item that you can eliminate from your life starting today? After much reflection and prayer I decided that broccoli was a non-essential for me. Therefore I do not grow, harvest, freeze, can, cook, or eat broccoli. This was helpful! I too waste SOOO much time on online chatting! Probably one thing I could eliminate to give me much more free time is online messaging. Just as I'm about to log out, somebody says hi and suddenly I spend another 45 minutes talking about pointless things! *Sigh* I will probably try to stop this. One non-essential I could eliminate (or cut back) from my life is facebook. Wish me luck!